Who are we? 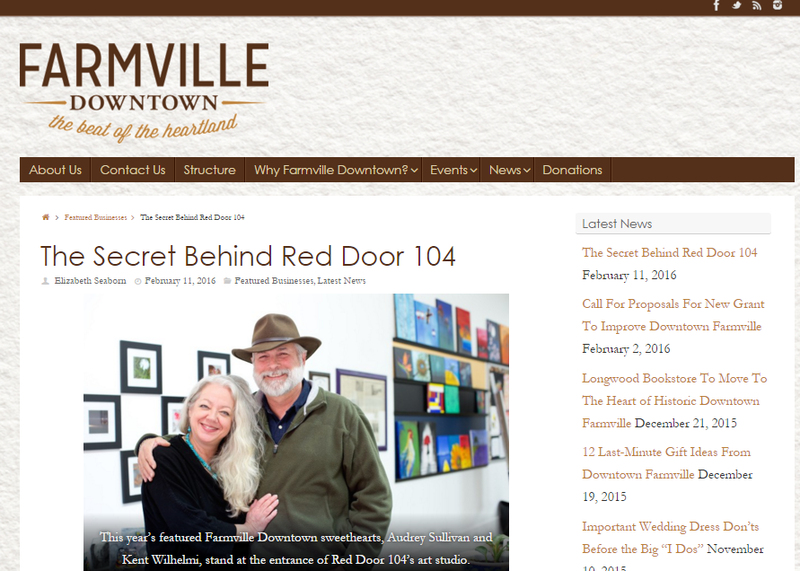 Audrey Sullivan, founder of Red Door 104, has been on a creative mission for over 20 years. Her passion for art was ignited at a young age while living in Italy and has continued well into her adulthood. After studying under some of the finest private instructors, Audrey came to learn the importance of hands-on discovery and exploration of the arts. In the course of her creative journey, Audrey founded the Escaped Artists Studio in Annapolis, Maryland—a successful decorative painting company offering faux finishing and mural work. In 2000, she became reacquainted with her childhood sweetheart Kent Wilhelmi. The two fell in love and relocated to Northern Virginia where they later married. A search for work in Northern Virginia then brought Audrey to the Workhouse Arts Center in Lorton, VA where she founded the “Kid Zone,” which offered art education to local children. This is where she discovered a deep love of teaching. Later, Audrey accepted a position at the Center for the Arts at the Candy Factory in Manassas, VA, where she initiated a one-year art curriculum for home-schooled students. Many of Audrey’s students followed her over the course of six to eight years and still stay in touch with her to this day. 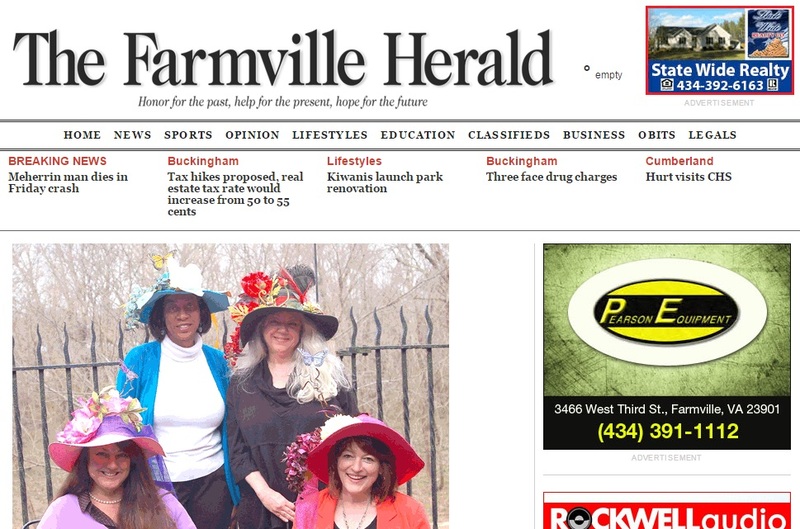 In April of 2013, Audrey and Kent made the important decision to move to Farmville, VA to be closer to family. Throughout their travels and adventures, they always dreamed of renovating an old building—a place to live and work—so finding an available space on Farmville’s Main Street was the first priority to make this dream a reality. This search brought Audrey and Kent to 104 N. Main St… and the two-year journey began! After months of construction and development, Audrey and Kent moved into 104 N. Main St. at the end of 2014 and settled into their newly renovated loft with their dog, three cats and bird. Although they face another year of construction to fully complete this ongoing renovation project, Audrey and Kent made the decision to open the doors to the studio/gallery space—formally known as Red Door 104—while work continues. 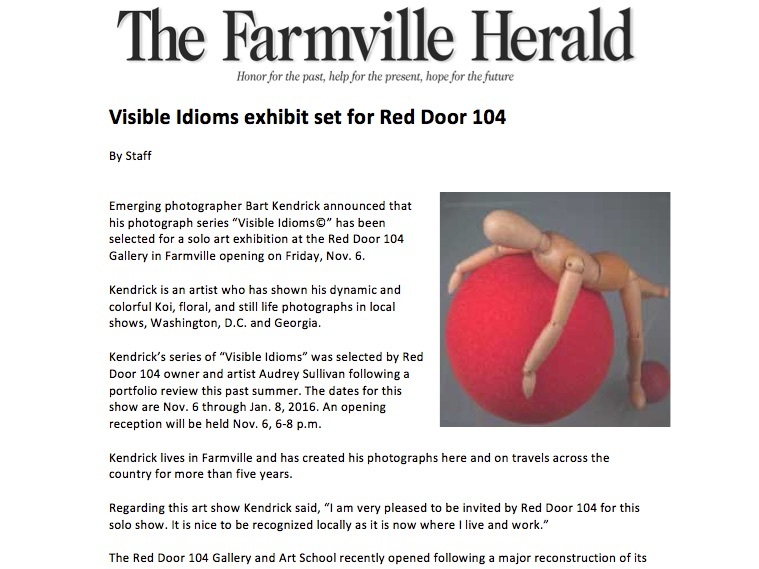 So where did the name Red Door 104 come from? The most striking aspect of the gallery and studio space: the front door. Purchased from a salvage yard, the massive 11’ by 6’ door is over 500 years old and was brought to North America by ship from Spain. The door’s most notable feature is a beautiful oxidized red color, which will be brought back to life through detailed restoration work. The unique door requires specialized attention, which will take time but one day soon, this red entryway will grace the front of 104 N. Main St., welcoming artists, creatives, friends and families into the studio. Be sure to check back for updates as Red Door 104 finalizes construction and feel free to contact us if you have any comments or questions! Check out the latest Red Door 104 news. Stay tuned for more updates! "Our experience with Audrey Sullivan’s art classes has been superior and has far exceeded our expectations. My two daughters began her class with minimal experiences in art and I am truly amazed what they have learned in the short period of time they have worked with Audrey. The workspace Audrey creates for her student’s is a truly inviting place in which to work, a true artist’s studio which she shares enthusiastically with her students. With her wonderful library of books and her hands on demonstrations, she encourages students to step out of their artistic comfort zone to try new genres, creative mediums and unique stylistic techniques. She was able to help each of my daughters discover their own individual artistic gifts. Confidence in each of my girls grew significantly as they continued to take on new projects they never before considered, and for me this was the most rewarding part of their experience. Audrey also shared various ‘tricks of the trade’ that my daughters valued highly, and she encouraged them to stretch themselves to new levels of confidence in their own abilities. I count Audrey as one of those rare teachers who comes into your child’s life and leaves a significant and positive impact." "My daughter is a left-brained math/science girl who has stretched her right brain through Audrey’s wonderful classes over the last four years. Almost half of my daughter’s life has been spent at Audrey’s side learning to enjoy art and discover her talents at painting. She would have gone to class every day if that had been an option. Audrey has a gift: an artist that can also teach. She gets the kids in a way no other teacher we have had (in any subject) does. My daughter can’t wait to get to class to see what the next project might be. Audrey has provided a comprehensive knowledge of art while allowing the kids to stretch their skills. There is a satisfaction in the work that my daughter has completed under Audrey’s tutelage that is like no other. Audrey is encouraging in pushing the kids beyond what they think they can do and the pride her students have in what they have accomplished is immeasurable." "My daughter Haly, had the pleasure of taking classes from Audrey for two full years. I wish it could have been longer. When she first started, Haly was a little hesitant, and a little unsure if she could “measure up” in a real art class. Over time, Audrey helped her to not only develop her artistic skills, but also to push what Haly thought were her limits, and create some pieces she is extremely proud of. She was able to explore many different artistic styles, many different mediums, and also learned a lot about many different artists. To say that Audrey is just a great teacher though would be to sell her short. She creates an environment in which children learn to look at and appreciate art in a new way. She provides instruction while allowing each child to explore his or her own artistic voice. Her studio became a place where my daughter felt happy and confident in her abilities. Audrey has a special way of connecting with children. When her students look back on their childhoods, and remember the people who really had an impact on their lives, I have no doubt that Audrey will be near the top of the list." "I have always had a deep passion for art, but I used to be very timid about taking an actual at class for fear I wouldn’t measure up to the standards. At one point, two of my friends were taking art classes from Miss Audrey; the art they made was so pretty. I didn’t think I could make anything close to what they were creating. I decided to give it a shot however, and that decision was probably one of my better ones, because I am not a better artist than I ever hoped I would be. There are many great things about Miss Audrey as I have learned over time, but here are a few that stand out to me. At the beginning, she had no expectations; she really just tried to make it a positive experience for me. She only developed expectations once she saw what I could accomplish. In Miss Audrey’s class, I have studied all different styles and pieces of art. I have also learned about the artists that made them. She creates fun projects that fit nicely into what the class is learning. She has assigned projects and she has let us pick from a a list that she comes up with, giving us some freedom to choose. Something I appreciate more than ever after taking classes with Miss Audrey is the class atmosphere. Her class has always had a very warm and happy atmosphere. She’ll play music in class (classic rock is included) She has introduced us to things that professional artists have to go through, one of which was a competition in which we even had to build our own canvasses. Our class has played with mixed mediums, which basically means using all different types of materials besides just paint to make a beautiful art project. Probably the best thing about her, however, is the way she treats her students. Every week she greets us with a smile on her face as if she has been looking forward to this day all week. I believe that she has made a connection with almost everyone of the children she teaches. I hope Miss Audrey can bring out your inner artist just as she has in me." "I came into Miss Audrey’s art class not knowing much about painting techniques. In this amazing class I learned how to create a glass appearance with paints, enter a piece in an art competition. Create a mixed media piece and paint beautiful flowers. Every week I look forward to going to Miss Audrey’s art class. Learning about a new artist then painting like that person. Miss Audrey has a wonderful and unusual way of teaching art to children where each child can learn something new and different even from the same project. For these reasons, I highly suggest Miss Audrey as the best artist and art teacher that I know." "I loved Miss Audrey’s class because she is kind and talented. I always got to pick what I wanted to paint from a magnet to a tray. She always helped me when I needed it, like helping me paint dragonfly wings, portraits and flowers. One of the things I loved about Miss Audrey is her spirit. She is funny and sometimes she tells stories in a really silly kind of way! She is a very talented artist because she can paint little 3x3 canvases to floor to ceiling paintings really well. Don’t hesitate on taking this class because you will NEVER find a better teacher around!"